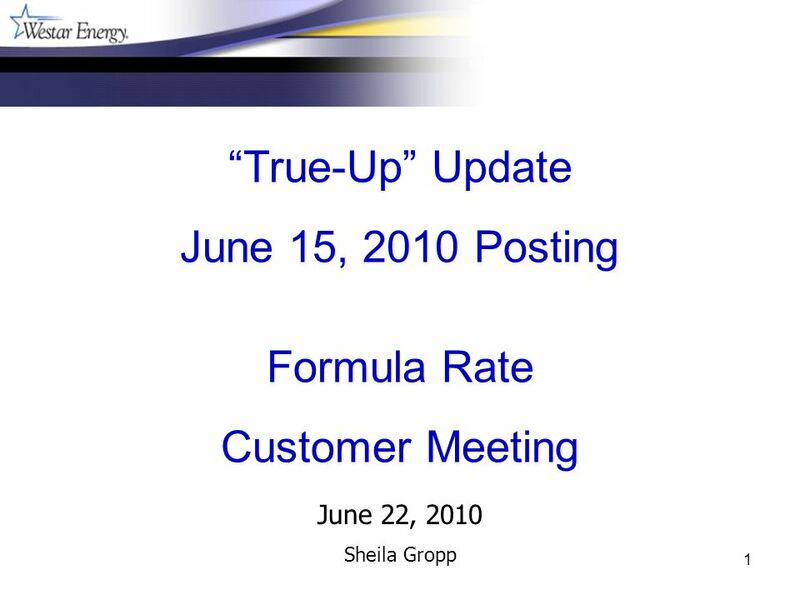 1 June 22, 2010 Sheila Gropp True-Up Update June 15, 2010 Posting Formula Rate Customer Meeting. 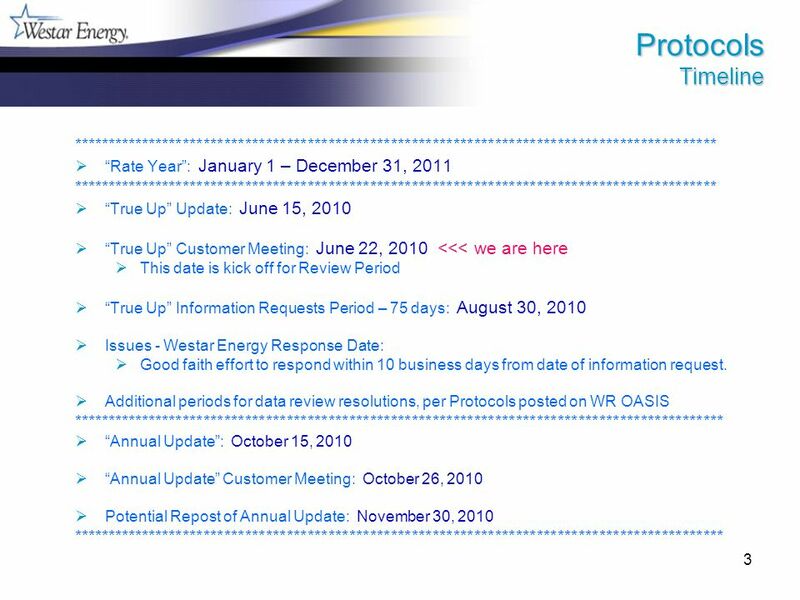 2 2 Protocols Definitions Rate Year is defined as January 1 through December 31, year Rate is in effect. 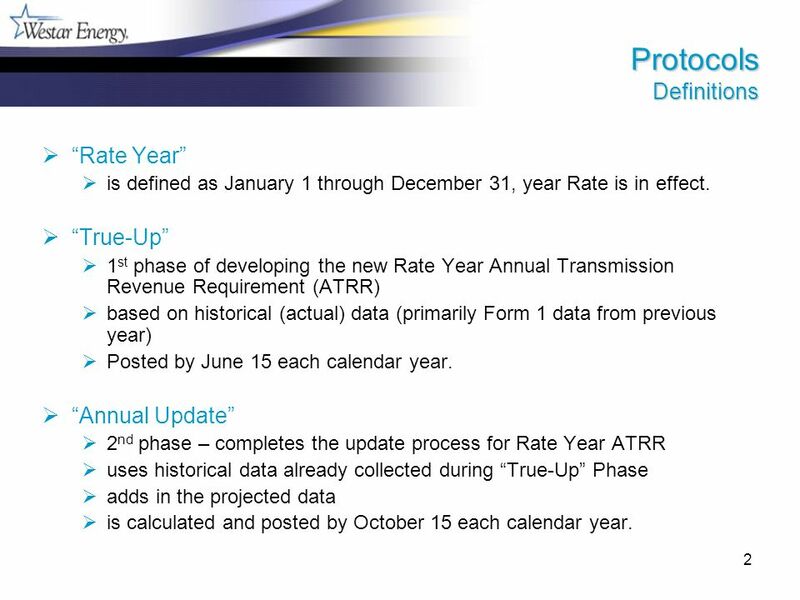 True-Up 1 st phase of developing the new Rate Year Annual Transmission Revenue Requirement (ATRR) based on historical (actual) data (primarily Form 1 data from previous year) Posted by June 15 each calendar year. 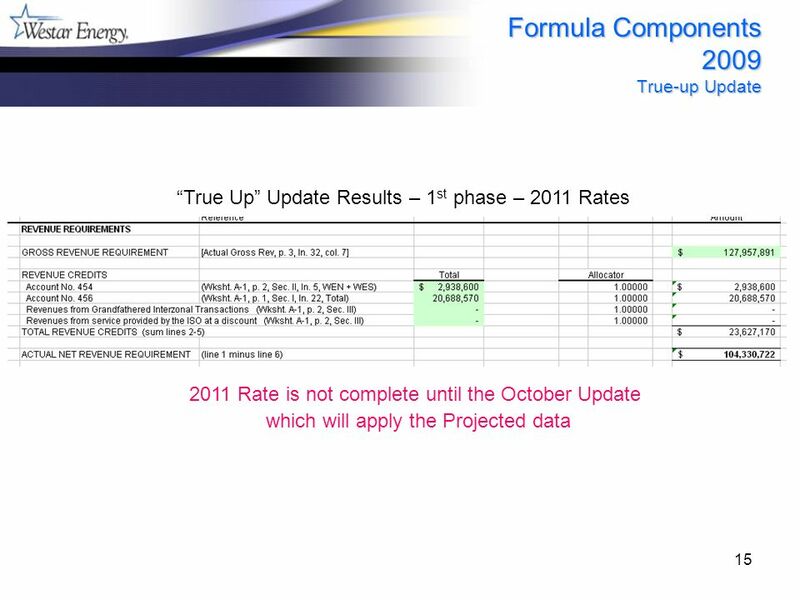 Annual Update 2 nd phase – completes the update process for Rate Year ATRR uses historical data already collected during True-Up Phase adds in the projected data is calculated and posted by October 15 each calendar year. 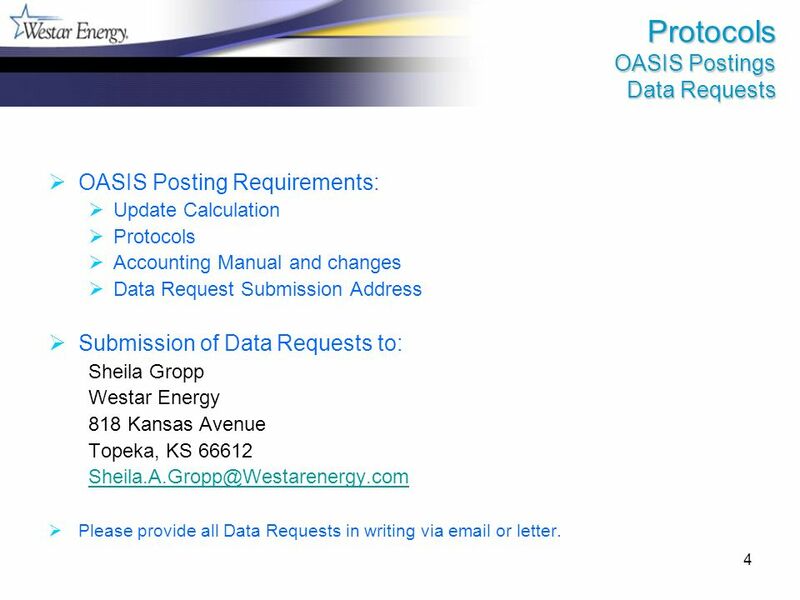 4 4 Protocols OASIS Postings Data Requests OASIS Posting Requirements: Update Calculation Protocols Accounting Manual and changes Data Request Submission Address Submission of Data Requests to: Sheila Gropp Westar Energy 818 Kansas Avenue Topeka, KS 66612 Sheila.A.Gropp@Westarenergy.com Please provide all Data Requests in writing via email or letter. 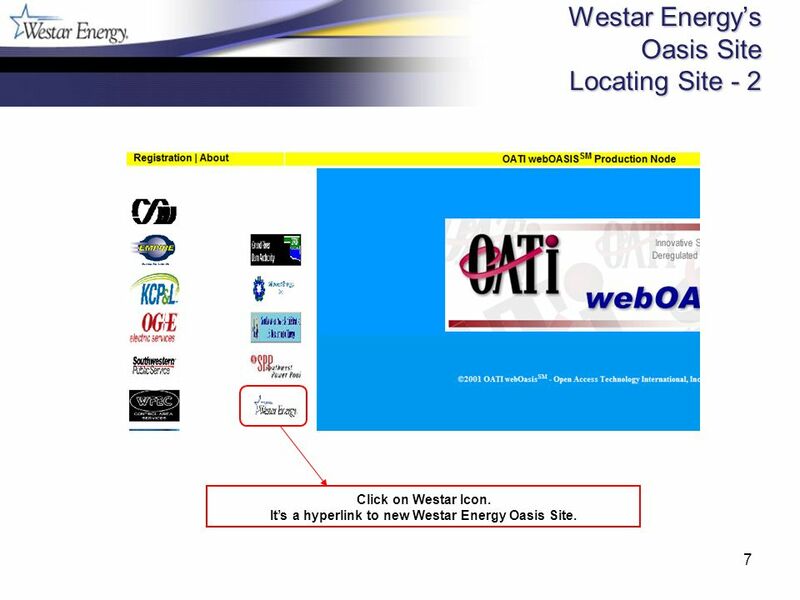 6 6 Westar Energys Oasis Site Locating Site http://www.oatioasis.com/ Click on SPP Icon. 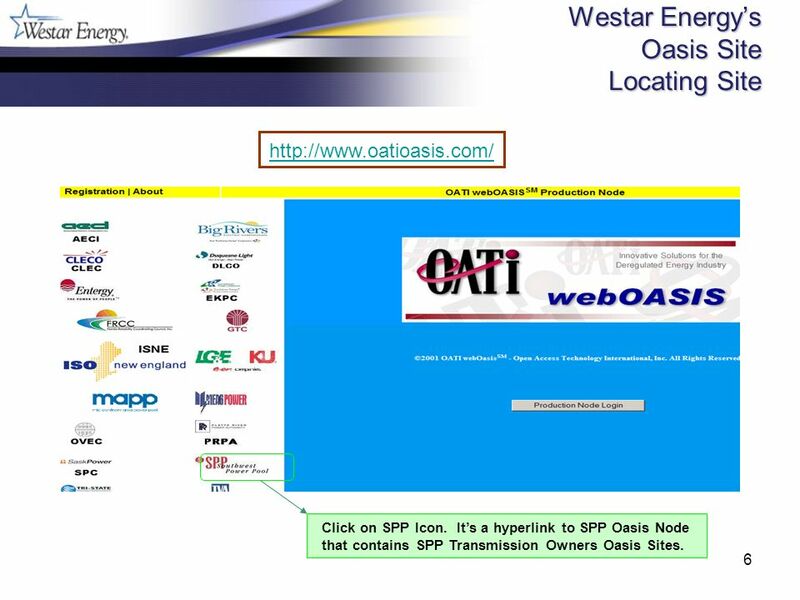 Its a hyperlink to SPP Oasis Node that contains SPP Transmission Owners Oasis Sites. 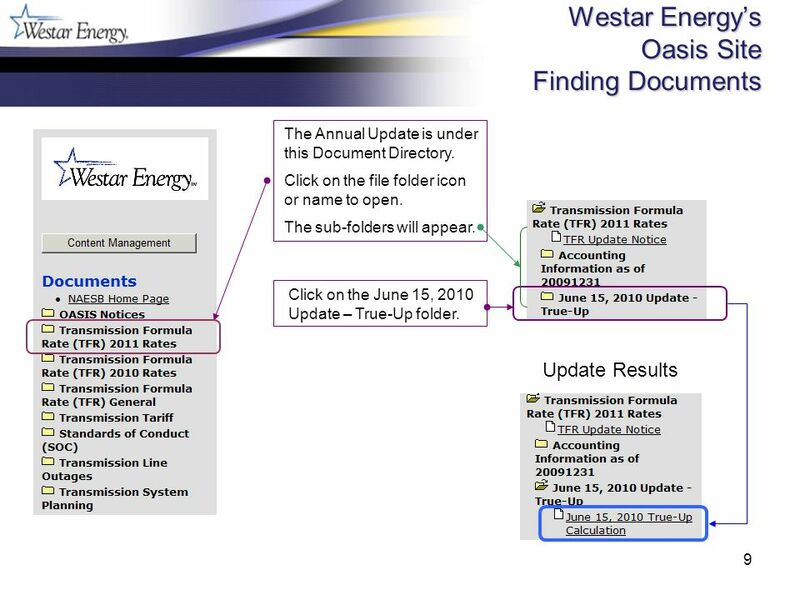 7 7 Westar Energys Oasis Site Locating Site - 2 Click on Westar Icon. 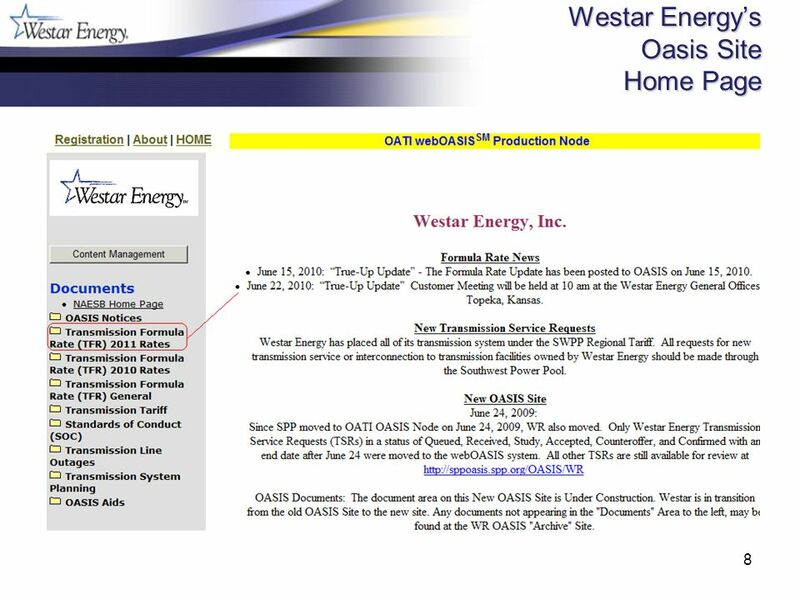 Its a hyperlink to new Westar Energy Oasis Site. 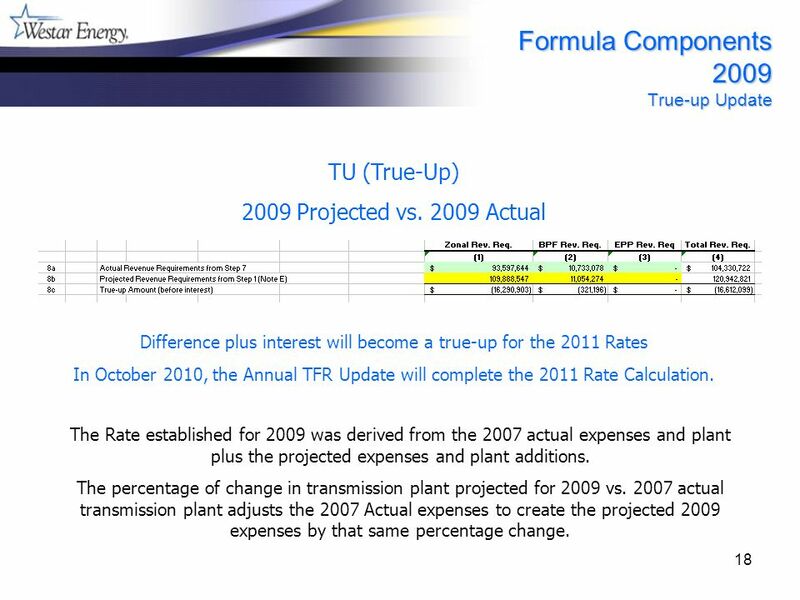 18 18 Formula Components 2009 True-up Update TU (True-Up) 2009 Projected vs. 2009 Actual Difference plus interest will become a true-up for the 2011 Rates In October 2010, the Annual TFR Update will complete the 2011 Rate Calculation. 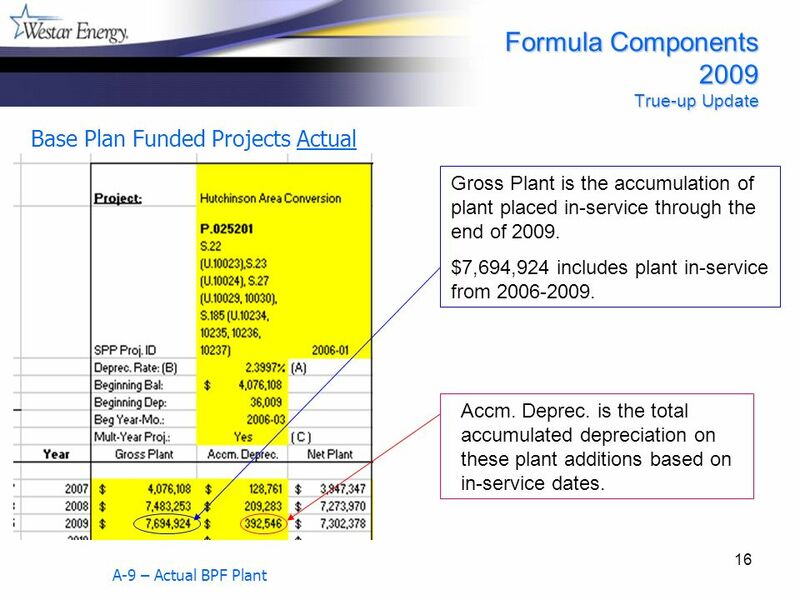 The Rate established for 2009 was derived from the 2007 actual expenses and plant plus the projected expenses and plant additions. 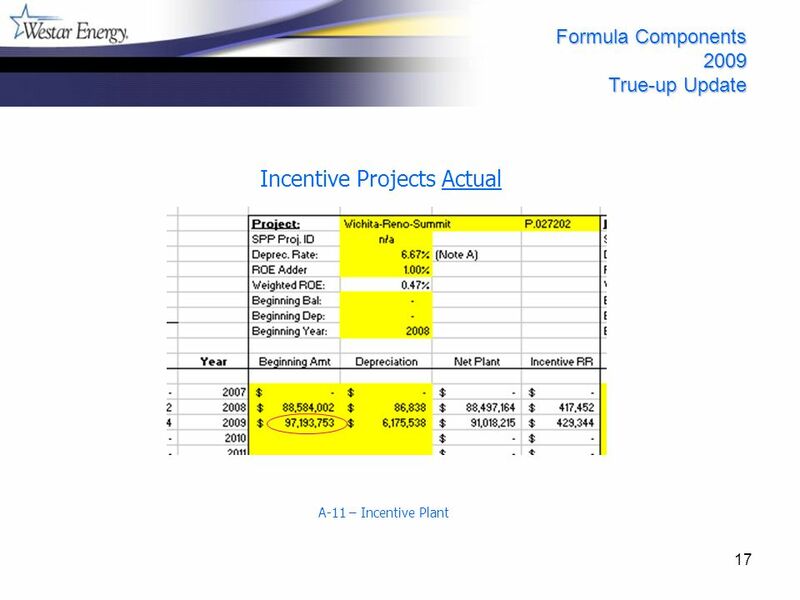 The percentage of change in transmission plant projected for 2009 vs. 2007 actual transmission plant adjusts the 2007 Actual expenses to create the projected 2009 expenses by that same percentage change. 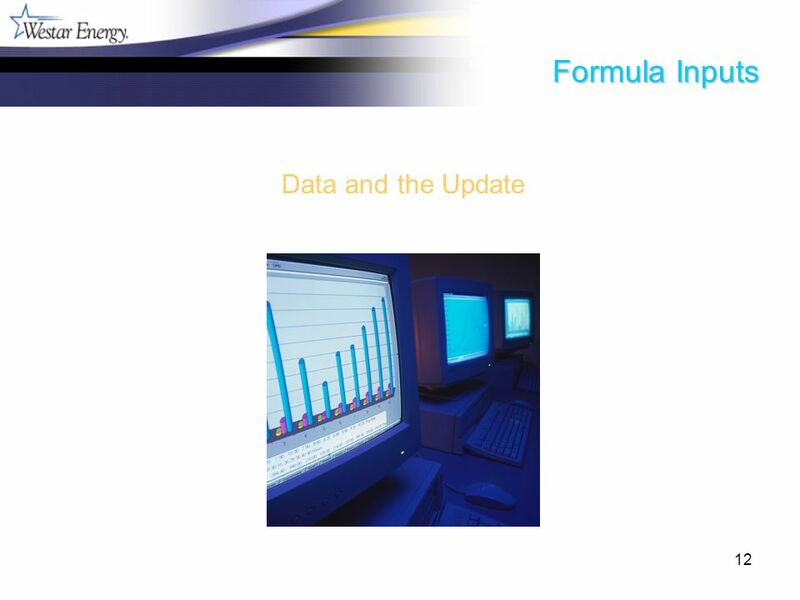 Download ppt "1 June 22, 2010 Sheila Gropp True-Up Update June 15, 2010 Posting Formula Rate Customer Meeting." SUMMIT IMPLEMENTATION REVIEW GROUP (SIRG) OEA/Ser.E Second Regular Meeting of 2010 GRIC/O.2/doc.7/10 December 9, December 2010 Simón Bolívar Room. 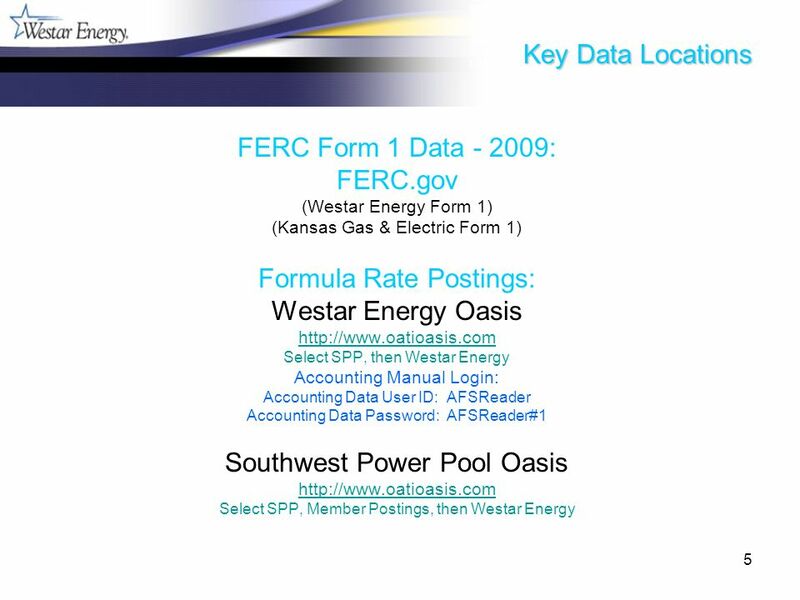 Westar Formula Rate and Regulatory Update Dennis Reed. 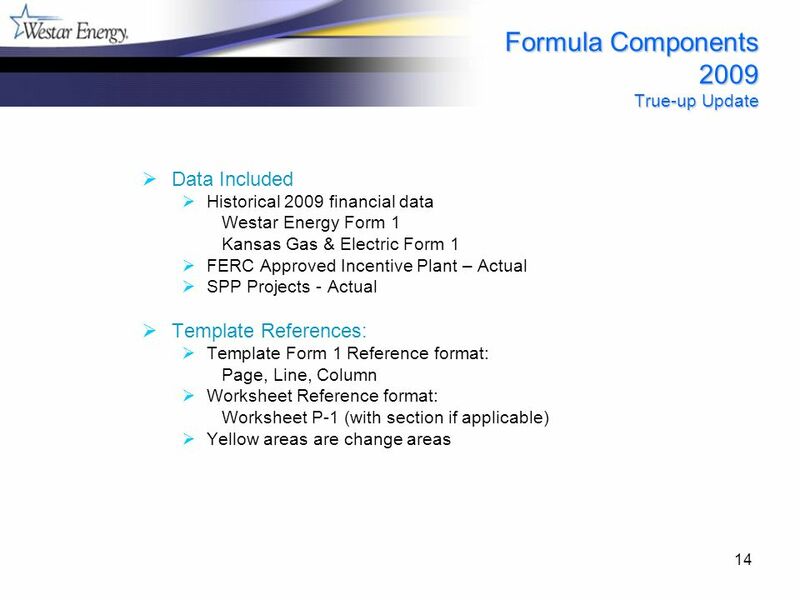 10/22/20101 Westar Formula Rate and your bill. 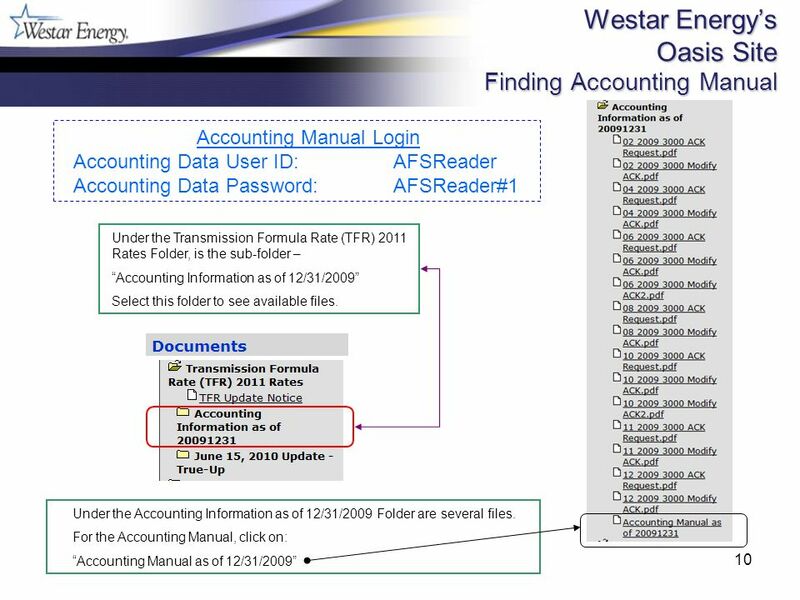 10/22/20102 What we will be going over Transferring the results from the Westar Formula Rate to the SPP. 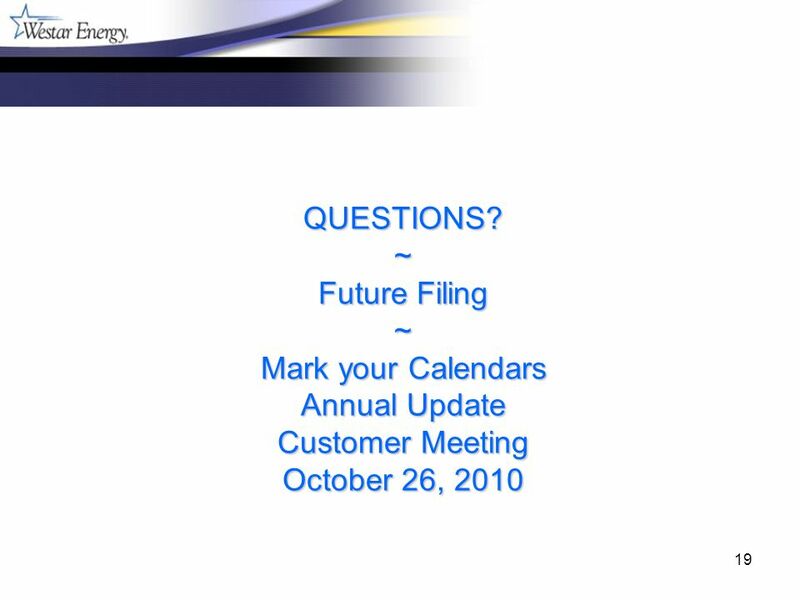 June 23, 2009 Actual Update For June 15, 2009 Posting Formula Rate Customer Meeting. 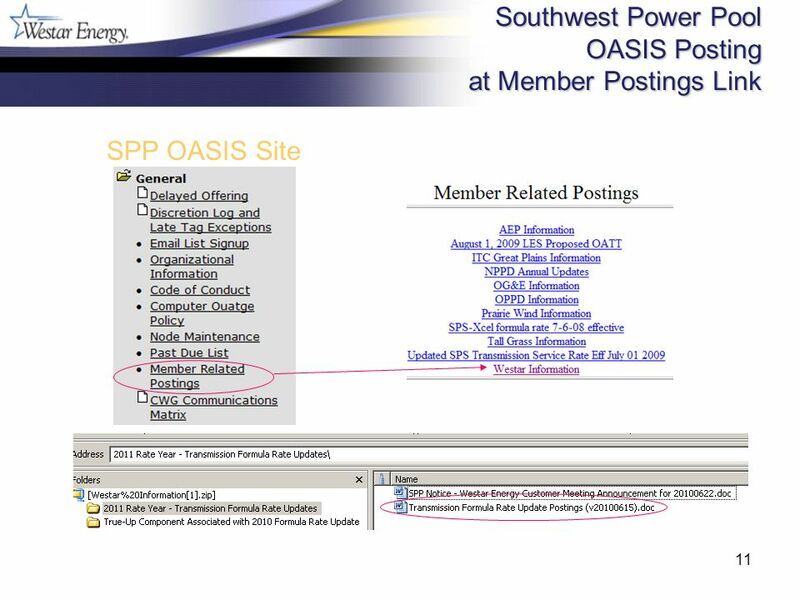 Rates Update Sean Sanderson Acting Rates Manager April 22, 2008. Standards Review Subcommittee Update April 30, 2013. Standards Review Subcommittee Update February 1, 2011. Standards Review Subcommittee Update October 22, 2013. 1 OAS Quarterly Resource Management and Performance Report June 30, 2013 Secretariat for Administration and Finance. Meeting held in Wien. 12th-16th October 2011 Coordinator: Sonia Roldán. FISCAL YEAR Financial Report June 2007 Year To Date. What can be learned from previous evaluations? Mikko Heino. 15 th November th SG meeting 2013 VIP Auction Results. 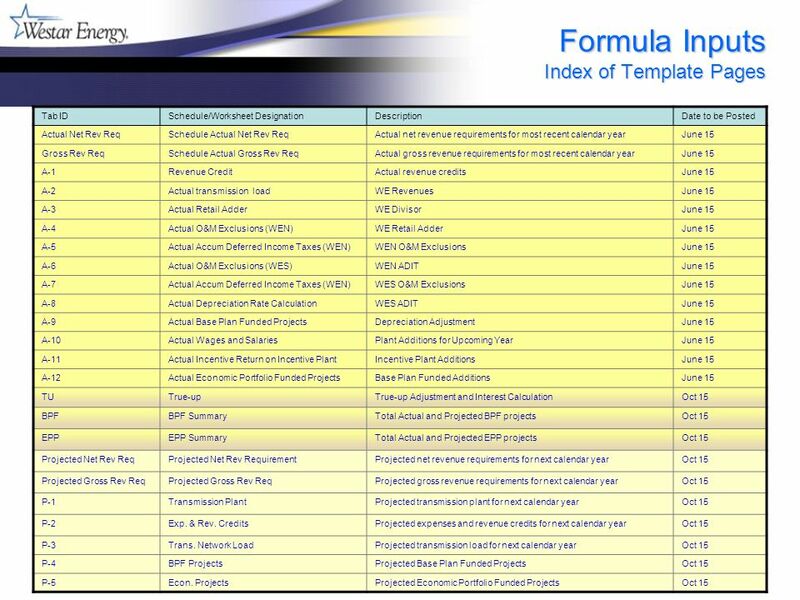 This handout was developed to illustrate the application of the transition relief for the adoption of a hospital facility’s first implementation strategy. Great River Energy 2013 Annual True-Up Meeting August 7, 2014.